You are currently browsing the archive for the Prayer category. How do you inspire someone to see the need? It requires exposure; it demands engagement, and that’s exactly what we’ve been fostering as we continue pressing ahead to see our vision of the Yucatan full of churches become a reality. 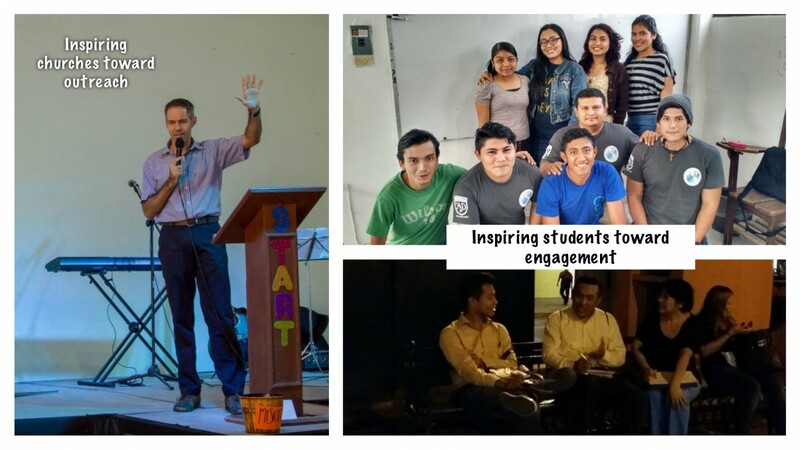 It began with a conversation, a suggestion that pastor Felipe Sabido utilize the Alpha course to encourage outreach in his congregation “La Mies” in northern Merida. You can imagine my pleasure, then, when last month, I was invited to preach the kickoff of “Start”, their 12 week course based on Alpha. Their plan: to host groups throughout the city, inviting friends and neighbors to explore the truths of Christianity in a non-threatening environment. 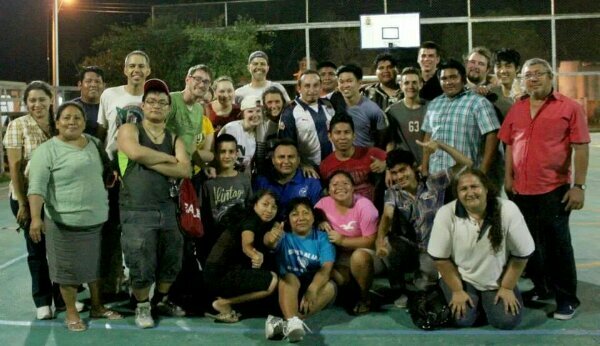 We’re looking forward to track with them as they open their homes to those seeking after Christ. At the same time “La Mies” was planning their outreach, 27 students from “Instituto Bíblico Bethel” were hitting the streets. My evangelism classes took to the public spaces of Merida to discover the impact that Christianity was having on the everyday lives of those they encountered there. While they found some encouraging signs, they also encountered areas of concern. For example, although 21% of those surveyed identified with an evangelical church, even they had difficulty explaining what it meant to be born again, and although a whopping 84% agreed that the Bible was the word of God, only 9% reported reading it on a regular basis. Clearly, there is work to be done. Pray with us that these experiences continue to bear much fruit! The book of Ezra, chapter 3, recounts the rebuilding of the temple when the Israelite had returned from exile. As Zerubbabel directed the final stones into place to finish the foundations of the temple, there was an interesting occurrence. The people lifted up a shout of rejoicing, thanking God for his help, but, at the same time, the elder priests and levites wept aloud, having remembered the old temple’s former magnificence. Zechariah speaks to these leaders, those who had been disappointed with the progress achieved. 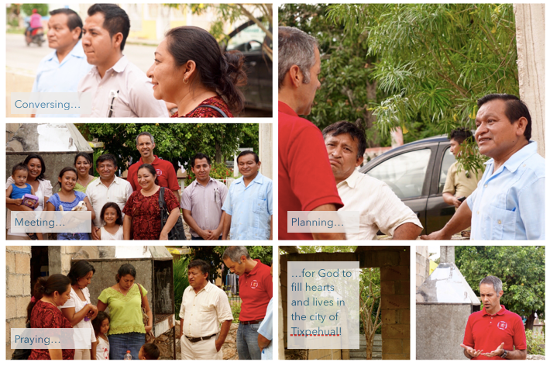 He says, “Do not despise these small beginnings, for the Lord rejoices to see the work begin…” (Zechariah 7:10). 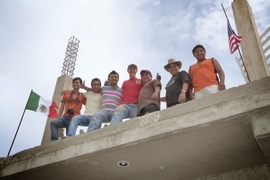 Tixpehual is a work in revitalization. Although the Assemblies of God has an almost 30 year history in that city, the work has failed to take root. This past Friday, however, eight of my students from Instituto Bíblico Bethel began preparing the foundations for a new effort. It all began under threatening skies. We had been praying for all aspects of the event, from the participants to the invitees, to the weather. Still, by the time we had left Merida, the heavens had opened, producing a steady downpour. We arrived to a town square literally under water! The conditions were certainly not in our favor. The first order of business was to prepare a relatively dry meeting place. Thankfully, Pastor Castillo, husband of the new leader of the work had come prepared. Two old event banners he had brought with him from Mérida were fashioned into an improvised roof while my students Abisai and Eric did their best impersonation of Spider Man, climbing the walls to set them in place. The next step was to remind the neighbors that, in spite of the rain, the event was still on. We passed through the neighborhood, door to door, speaking with those who had received the printed announcements the Wednesday before. Still, 5:00, the scheduled time of the event, came and went without so much as a single attendee. Things were beginning to get tense. A new group was sent out, reminders were given, but people did not seem to be moving toward the house where we were meeting. Then we were told: “When you announce a time, it means that the event will start an hour later.” Sure enough, the people came. By the time the event was underway the rain had passed, and five families, moms with their kids had arrived at the house. 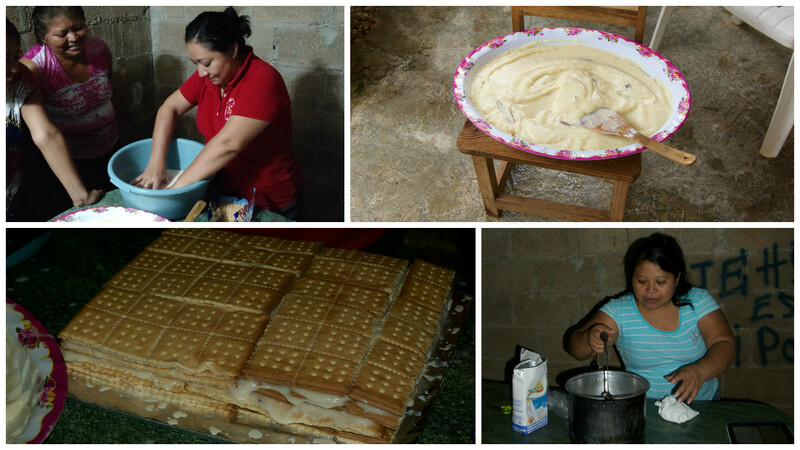 Women were learning about making “pastel de galleta” a cake out of crackers, at the same time that they were hearing testimonies of God’s work in students’, (Maribel and Geydi) lives. Next door, their children were jumping, singing, working on crafts, and listen to a message about the God who loves them told by Abner and Abisai. The culmination of the evening came just before dinner. The ladies sat at a table prepared for them, while Jorge shared scripture and asked if we could pray with them. All of them accepted, and not only did they allow us to take down their names and addresses, they opened up to us, letting us know their struggles and concerns. That prayer time was a special moment. As we began to reflect on our experiences, many of the students shared that there was a reluctance expressed by many of the ladies as they deliberated attending the event. Some of them had prior experiences gathering at such activities and knew the abandonment that comes when, for one reason or another, the church, or the support group, or the workshop closes its doors. The conclusion: the work must go on. We’re so thankful, then, that we were able to install Pastor and his wife Olga as the new leaders of the cell group that is being restarted in Tixpehual. Starting this weekend, they will be available Saturdays and Sundays, visiting, holding Bible studies and encouraging the unsaved to trust in Jesus and Christians to deepen their walk with him. Following the event, there were those who had been disappointed that more hadn’t arrived, but Isabel, the owner of the house was very encouraged. She expressed her gratefulness for the opportunity to use her home to be able to serve and speak into the lives of her neighbors. 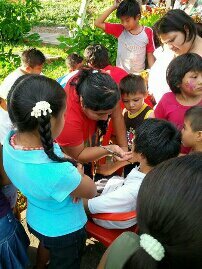 She was thankful for this small beginning in Tixpehual and hopeful for a brighter future. Did you enjoy the story? Be sure to look at our photo gallery of these shots and others, taken by Rebekah Godzwa. On October 16 at 4:00 pm, we will be traveling with several students to Tixpehual (pronounced Tish-pay-wall) to host an evangelistic event charged with the difficult task of spurring on a flagging work in that city. Tixpehual is a city that desperately needs a turn-around. A site of evangelistic outreach since the 1980’s, several denominations have tried to gain a foothold among that population. Sadly, failed projects, manipulative leaders, and backslidden believers have caused the work to stall and hopes to fade. In addition, spiritism and cultic practices exercise influence over several that live in the city. Hers is the attitude that we share as we go. We will be inviting friends and neighbors of a family that is currently attending the church to a practical workshop and a meal in the home pictured above with the goal of sharing the gospel message with them. We are busy preparing the details, organizing the supplies, and planning the schedule, but we haven’t forgotten who it is that will make the difference in that city. Pray for us, won’t you? 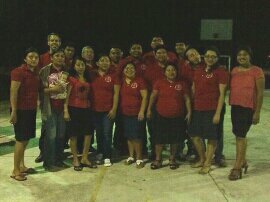 Pray that our efforts will pull together a memorable event for the residents of Tixpehual. Pray for the enthusiastic participation of the believers in that community. 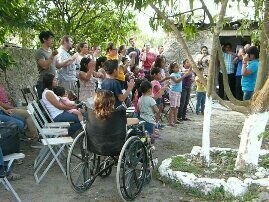 Pray for redemptive relationships to be formed among those who attend the event, and pray that this outreach will bear fruit, fruit that lasts, fruit that once and for all cuts through that skepticism that hangs over the city of Tixpehual. Early Tuesday morning we loaded eight action packers (a missionary’s equivalent of a suitcase), a guitar, a violin, a dog and a family of five onto a plane bound for Chicago. Three connection flights later, we landed in Merida, Yucatan, the city we will be calling home for the next four years. Thanks to you we can finally say “We made it!”. 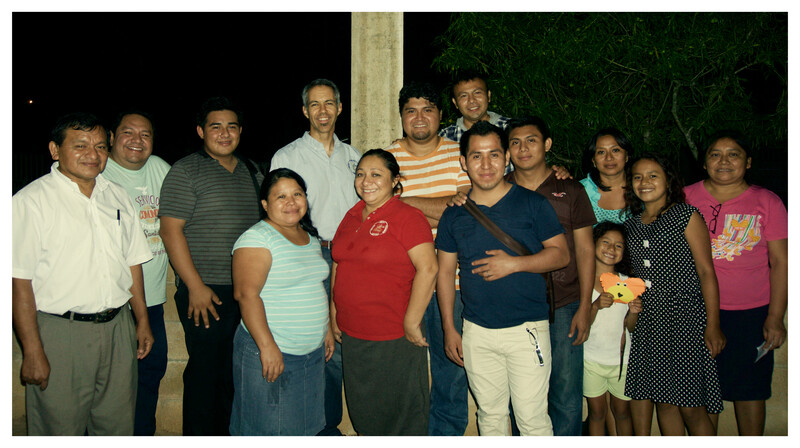 Gabriel Gongora, a local pastor, and his wife, Leticia, met us at the gate with Yucatecan hospitality. Julio Montejo, another friend, was there with his truck to load up our bags. After a few delays (of those 8 action packers only 7 made it) we arrived at a house Silverio Blanco, the district missions director, has loaned us until we can find one of our own. We were met by his son, Eliú, and his wife, Doris, and son, Moisés. The rest of the day and Wednesday we spent getting new phone numbers and looking for houses. The search was on! 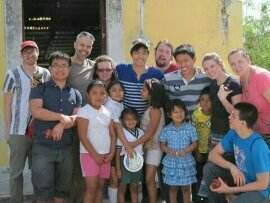 Thursday, we were able to enroll Joseph and Jonathan into Centro Educativo Calvary (Calvary Christian School) and see some old school friends. We also looked at three or four different houses. Thankfully, the last action packer arrived as well. 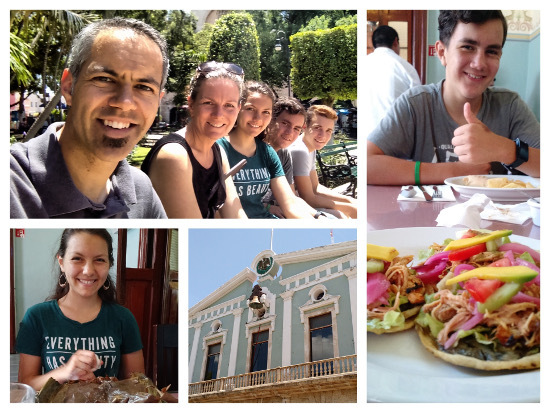 Friday we visited ‘el Centro’ for the first time since we got back, where we were reacquainted with the hustle and bustle of Merida’s downtown. We ate delicious typical foods like, Pollo Pibil ( chicken cooked in banana leaves), Panuchos (fried tortillas filled with refried beans and toped with turkey and vegetables), and Sopa de Lima (lime soup with chicken). Later on we looked at more houses and might continue to do so for the next week. We aren’t despairing yet though. Searching for a house that meets all our needs is time consuming and requires lots of thinking and input from family members. We are confident that God will show us the right one. Thank you again for all your prayers and support. It means a lot to us. We’ve driven over 33,000 miles during our itineration year. We’ve driven through early morning sunrises and lazy Sunday afternoons. We’ve navigated through the night and on into the next day as well. We’ve hit rain storms and snow storms, even hail, but never have we been made more aware of our need for prayers as we travel than last Tuesday night. It all happened in an instant. We were driving a stretch of I-44 that we had been on perhaps a hundred times before. In fact, we weren’t even on a ministry trip. 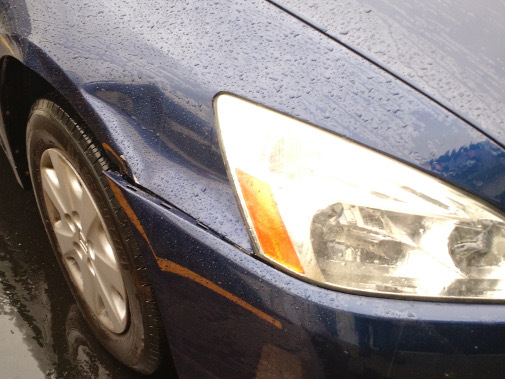 Then, there was a flash of brown in the headlights and a thud. We had hit a deer. At first there was the irony of it all. All of those miles, many of them on secondary roads through the Mark Twain National Forest, and we hit a deer in the suburbs of Springfield! The next morning, however, we began to reflect on how fortunate we were. A few seconds earlier, or a few inches to the left would have been enough to cause significant damage or cause us to lose control of the car altogether. Let’s just say that morning devotionals had a much more thankful tone to them than perhaps the day before. We communicate all of this to let you know that we covet your prayers! We take precautions and drive defensively, but we can never assume that we have full control over any situation. So thank you for lifting us up over the next 6,000 miles that we have yet to cover for this itineration and beyond. As our incident with the deer proves, we depend on them! Speaking of prayers, thanks for praying on our behalf through the month of April. Since our last update, we’ve seen our monthly commitment total reach 99%! We are nearing the finish line. Please join with us in prayer for those who have committed to our support, that God would bless them with the resources to not only honor their commitment but prosper because of their heart to reach the lost! Although up north the freeze is still in effect, here in Mexico, we’re preparing for spring. Spring Break, that is. 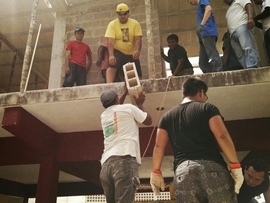 This Saturday, 10 members of the Chi Alpha Student Fellowship of American University will be descending on the city of Mérida, Yucatán to do a bit of construction and outreach while they thaw from this year’s deep freeze. In the mornings, we’ll be working at Instituto Bíblico Bethel, to put into place the beams and slabs that will serve as the structure for the roof of the second floor of the multipurpose building. 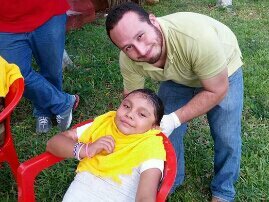 In the afternoons, we’ll be returning to Sierra Papacal to assist the efforts of my former student, Guadalupe Campos, in the church, Casa de Oración. My favorite part of the trip, however, is the opportunity for our Bible school students to work hand in hand with our visiting Chi Alpha workers. Pray for safety in our work and travels. Pray for the effective integration of the different groups. 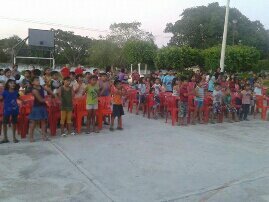 Pray for an enthusiastic response among the people of Sierra Papacal. 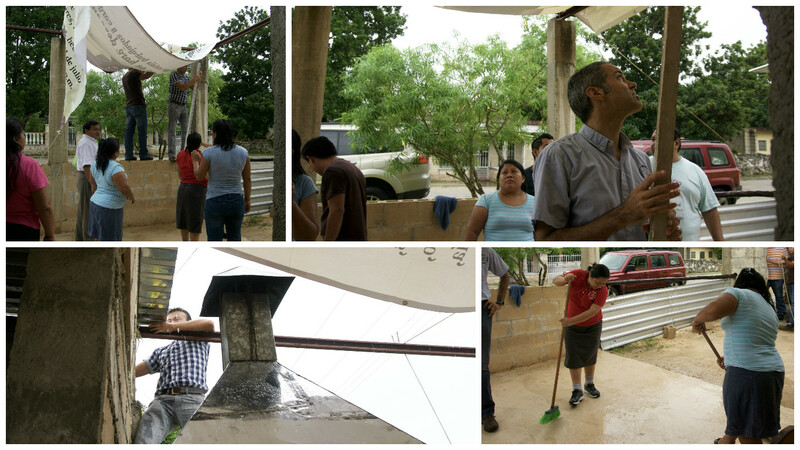 The Chi Alpha students have a goal to bless the ministry that is taking part here in the Yucatán. You can be a part of helping them realize that goal. Navigate to our giving page and send a special gift. Put AUXA in the comment section, and we’ll be sure to designate that gift to the projects in which they’re taking part. While you might not be able to bask in the Yucatecan sun with us, we’re sure that your participation, in one or both of these areas, will bring some warmth to your weary winter days, and, just maybe, you too might be thinking that spring is in the air! Recently, a study was done here to determine the biggest problems facing the Yucatecan society. What were they? Drug and alcohol abuse and violent gang activity, two dangers that go hand in hand. According to those interviewed, almost 7 out of 10 felt threatened by the consumption of drugs and alcohol in the streets. Furthermore, the presence of violent gangs was felt 13% more acutely here in the Yucatan than it was nationally. Clearly, Yucatan’s problems with controlled substances have given many cause for alarm. 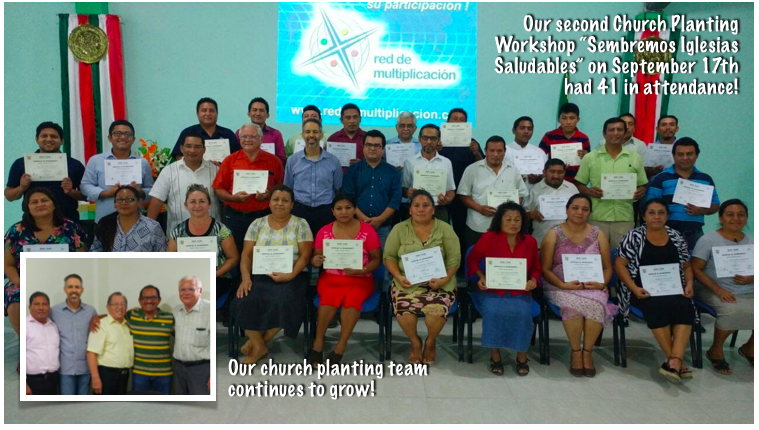 Still, Yucatan’s substance abuse problem presents us with an opportunity to provide a solution, and to provide that solution through the local church. Think of it, raising up centers all across the state where those looking to find a way out could find real help. Certainly, there are risks involved, but the benefits are compelling: not only would those using drugs and alcohol be helped, but society as a whole would be able to breathe a sigh of relief, and esteem for the church and its life-changing message would grow. This is the precise reason that we’re moving to the next level in order to help our churches to begin an outreach to those with life controlling habits. 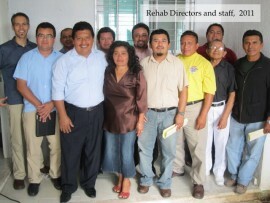 We’ve already been working to resource and train the directors of two Assemblies of God rehabilitation centers. Now we’re looking to network and coach our ministers to be first responders as we battle with this all too present evil. On November 22nd, Gregg Fischer, from Global Teen Challenge, will be with us to kick off a series of seminars based on Living Free materials designed to help pastors and leaders set up small groups where those trapped in the cycle of substance abuse can find help. Our desire, then, is to connect these leaders with our rehab directors and staff who can insure that they receive the follow-up, encouragement, and direction that they need to maximize the potential of these groups and lend a hand when necessary. Interest has been high and the response has been encouraging, but we need your help for these seminars to reach their full potential. We need your prayers! Pray that we reach our goal of training at least 50 pastors and leaders. Pray for the timely and inexpensive printing of the materials that we need in order to teach. Pray for our travel throughout the district as we participate in the teaching of these seminars. Pray for my ability to accurately and fluently translate the material being presented. Pray for a desire on the part of our pastors to implement this ministry in their church and a clear vision for how they might go about making it a reality. Thanks again for standing with us!